Baldy Mountain Townhomes in Breckenridge CO Real Estate are large Breckenridge townhomes with incredible mountain views of the Ten Mile Range. Baldy Mtn Townhomes are only 2 miles from town off of Boreas Pass Road and are steps from the Summit Stage bus stop. Built in 1972 there are 72 Baldy Mountain Townhomes ranging in size from 1 bedroom to 3 bedrooms plus loft. 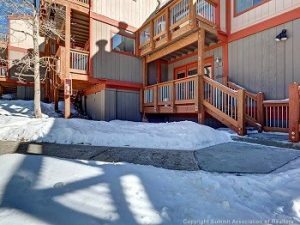 These are some of the largest most affordable Breckenridge townhomes. Many Baldy Mtn Townhomes in Breckenridge Real Estate are multi-level properties spread out on 2-3 floors. The homeowners association has recently redone the exteriors including decks, railings, stairs, siding and more. Just steps from your front door are many hiking and biking trails, some even pass by old mine tailings. Baldy Mountain Townhomes are great properties if you are looking for more space at an affordable price. View details and pictures of Baldy Mountain Townhomes currently for sale below.